Since trying these "stacked enchiladas" for the first time 8 years ago, this has been my go-to recipe for enchiladas. The delicious combination of flavorful and healthy ingredients--the tart tomatillos and fresh herbs of the nuanced salsa verde, the tortillas all soft and creamy from their slow bake nestled among layers of salsa and sour cream (or in my most recent version, Greek yogurt), juicy bites of chicken throughout, and savory cheese with a golden crunch on top--gets to me every time! I'll just say up front that this is not your typical enchilada recipe. 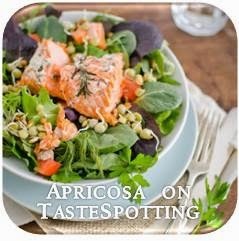 This is my kind of California cooking--a relaxed fusion of fresh ingredients and local flavors, using what I have on hand and figuring out an easy and healthy way to enjoy one of my favorite dishes. I mean, tomatillos!! cilantro!! quality cheese!! oh my goodness, I just am beside myself with joy to have these ingredients at my fingertips again. Hope you enjoy these enchiladas as much as I do! 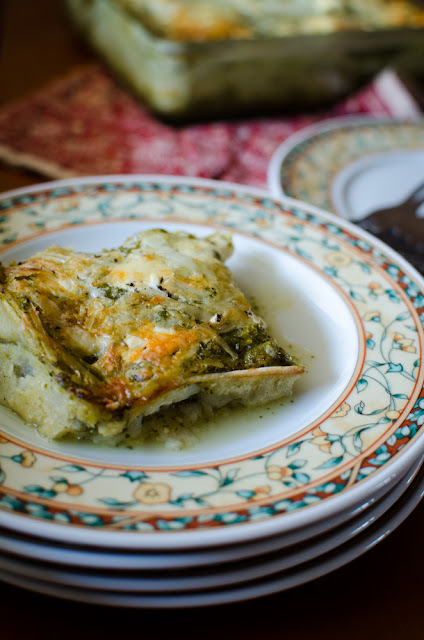 Preheat the oven to 350 F. While oven is heating, assemble the enchiladas: spread 1/2 cup salsa verde over the bottom of an 8 x 8 glass or ceramic baking dish. Arrange 3 tortillas in a single layer, breaking tortillas in half and overlapping them as necessary to cover the surface. Sprinkle half of the shredded chicken over the tortillas and drizzle with salsa (a generous 1 cup worth) and half of the thinned yogurt. Repeat with 3 tortillas, the rest of the chicken, a generous cup of salsa, and the remaining yogurt. Top the enchiladas with the last 3 tortillas, the remaining salsa, and sprinkle the grated cheese over. Bake the enchiladas for 45-60 minutes, until cheese is bubbly and turning golden brown. Remove from oven and serve hot. Pass chilled Oregano-Pickled Carrots at the table as a refreshing accompaniment. Makes 5-6 cups. Any leftovers not used in the enchiladas would be delicious served over slices of grilled tri-tip! Place the whole tomatillos, jalapenos, and garlic cloves in a medium saucepan and add just enough water to barely cover. Bring to a boil, then reduce heat and simmer for about 15 minutes, until softened (avoid over-cooking, which will cause the tomatillos to burst). Drain off and discard the water, then place the cooked ingredients in the large bowl of a food processor (or blender). Let cool slightly, then pulse to coarsely chop the tomatillos. Add the cumin, salt, and fresh herbs, and process until smooth. Salsa can be made ahead; keep stored in the refrigerator and use within 1 week. These quick-pickled carrots are a tasty accompaniment to enchiladas and tacos and serve equally well as part of a charcuterie plate or as a simple snack on their own! Place vinegar, water, sugar, and salt in a small saucepan and bring to a rolling boil, stirring until sugar and salt have dissolved. Pack carrot slices into a clean, heat-proof glass jar and sprinkle the oregano and cumin over, then pour the hot vinegar solution over. Press carrot slices to submerge. Let cool slightly, then close the jar and chill completely in the refrigerator before serving. Use within 1 week. It's always such a nice surprise to see your posts, Erica! These reminded me of spinach enchiladas recipe that my son just called to ask about ... yours look so much more authentic ! Hello Susan, thanks for your kind words! 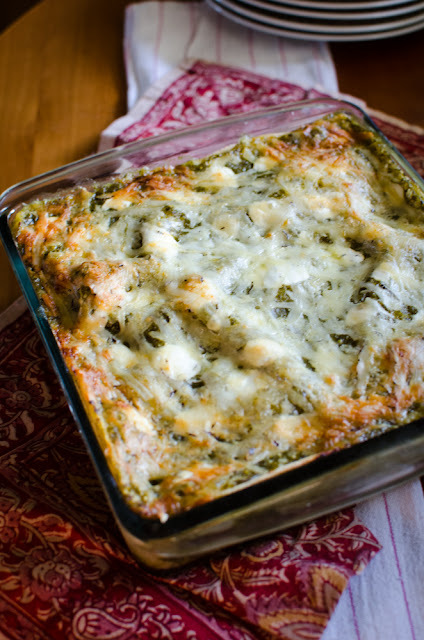 And I love the idea of spinach enchiladas--I want to keep that in mind for next time! Juicy and creamy it really looks. And you've made it sound healthy is so very delicious!